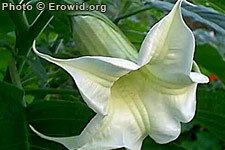 Brugmansia is a small to mid-size tree with large, strong-smelling, trumpet-shaped flowers hanging downward. Most parts of the plant contain atropine, scopolamine and hyoscyamine. It has been used as an admixture plant in ayahuasca brews as well as in poisons and medicines in S. America.